Have you ever heard of metamaterials before? Did you know that when you combine design and engineering you can create new properties that you cannot find in nature? 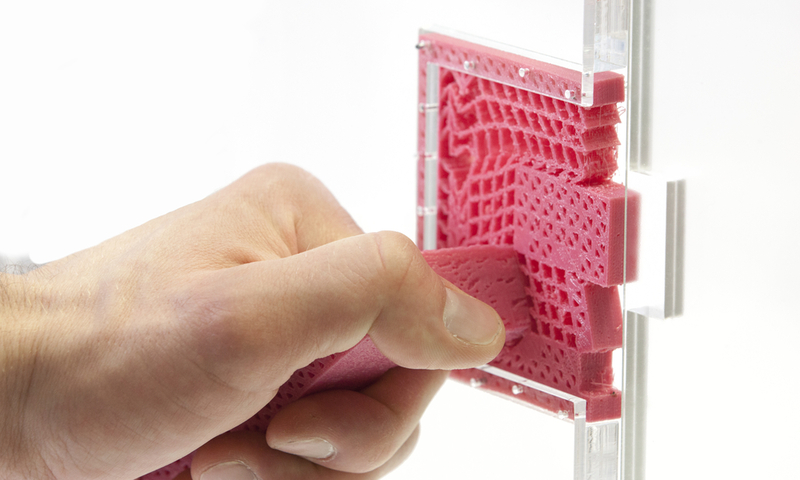 Metamaterials are pretty impressive for this: for their emerging properties. Promising as it sounds, it has already been studied by researchers at Hasso Plattner Institute in Potsdam, Germany. In this blog post, we will introduce you to the metamaterial mechanism and see how they can be 3D printed so that they perform as machines and not as passive constructions. Also, we will see some of the applications of metamaterials and we will explain how metamaterials work. Metamaterials are materials that derive their mechanical properties from their structure and not from the material they are made of. They are named metamaterials after the Greek word “μετά”- “meta”, meaning “beyond”, because their newly designed structures go beyond the natural arrangement, to new forms of organization. Metamaterials are made from assemblies of multiple elements and they are structured in a way so as to give us the mechanical properties we want, and which we cannot find in ordinary materials. They are characterized by repeated patterns and grids, with precise shape, geometry, size, orientation and arrangement. When the user applies a force to the handles, the hinge array in the center transmits this force to the brackets, and the liers close. Are there different types of metamaterials? Yes! When talking about 3D printing experiment with these artificial materials, we are referring to mechanical metamaterials, or elastic metamaterials. Keep in mind that other metamaterials exist, such as electromagnetic metamaterials. Some electromagnetic metamaterials, such as photonic metamaterials, interacts with light and have a negative refractive index. Negative refraction is when light refracts or bends outward on the material. It is one of the main differences that they have with materials such as glass lenses, that has a positive refractive index. The electric and magnetic field of these electromagnetic materials are the opposite of the behaviour of optical devices materials. Metamaterials are also known be linked to some experiments to create invisibility cloaks, thanks to this negative refractive index. Indeed, a cloaking device has been made in 2006. It was partially working, but it proves that these artificial materials are allowing to do science experiments that were typically impossible with natural materials. Due to metamaterials mechanisms’ newly designed properties, they have the ability of influencing electromagnetic waves by blocking, absorbing or bending waves, to cause impact that goes beyond what is possible with conventional materials. This allows constructing applications which would never have been feasible with conventional materials. Nor many fields of engineerings will remain unaffected by the introduction of metamaterial mechanisms. Some of the fields which have already embraced them are optical filters, medical devices, electrical engineering, remote aerospace applications, sensor detection, seismic metamaterials and much more. Just to give an example, metamaterials allow for creating superlenses which permit imaging below the diffraction limit that is the minimum resolution that can be achieved by conventional glass lenses. In this blog post, we will see applications of mechanisms of metamaterial objects that perform a mechanical function, such as macroscopic movement. Metamaterials are artificial structures with mechanical properties that are defined by their usually repetitive cell patterns. Based on this concept, researchers have created objects with unusual behaviors, such as metamaterials that collapse when compressed, that shrink in two dimensions upon one and objects that mix layers of soft and hard cells in order to emulate different materials. This allows users to create objects that perform mechanical functions, as we will explain below in the article. The key element behind the metamaterial mechanisms is a specialized type of cell, which only ability is to shear. Unlike the rigid cell, this shear cell is designed to deform in a very specific way when a force is applied: when subjected to an external force, it shears and thereby applies a force to its neighboring cells. When a shear cell is subject to compression forces, it complies by shearing on a circular trajectory. The objects described below implement devices that transform input forces and movement into a desired set of output forces and movement – also known as mechanisms! The following picture shows a door latch mechanism. This door latch is implemented as a metamaterial mechanism. It consists of a single block of material based on a grid of cells that together implement handle, latch and springs. When you push down the handle, it causes the central hinge array to deform, the cells shear and the latch of the door is pulled inwards which unlocks the door. This one is a pantograph. It is a single part that consists of cells of different elasticities. One edge of the pantograph is attached to the desk and the rest of is free to move. Two pencils are placed on the grid, but only one it is meant to be for the user to draw. When the user of the mechanism is drawing something with his pencil, the secondary pencil creates an identical replicate of the original drawing on a smaller scale. You may wonder, don’t these structures ever break? The answer is no, because metamaterial mechanisms operate only to the point where they still fully return to their original shape. So, material fatigue or material damage is not a problem. Are you intrigued by the uses and the potential of metamaterial mechanisms? 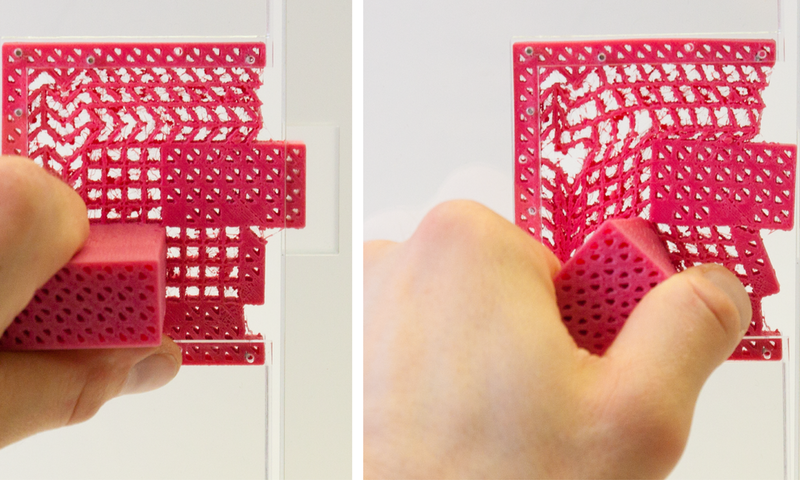 Don’t hesitate to create your own 3D printed metamaterial mechanism! Once you create the 3D design of the structure that fits your purpose save it in .STL format and upload it on our online 3D printing service. You can pick the 3D printing material of your choice among the many we provide you. The ideal materials for metamaterial mechanisms are the very elastic ones as they return to their original shape without deforming permanently and the materials that withstand high forces without breaking. Our PEBA 2301 fulfills the criteria of elasticity as it is a very flexible material. We also offer you flexible polyurethane that withstands repetitive stresses such as hinging mechanisms and friction fits or elastomeric polyurethane which has an excellent elastic behavior under cyclic tensile and compressive loads. You can create a metamaterial mechanism with laser cutting as well! Though, keep in mind that there are a few more constraints compared to 3D Printing. The most obvious restriction is the design freedom. For example, you cannot create lattice structures and impossible geometries such as these you can achieve with 3D printing. The functionality of a metamaterial mechanism is defined mostly by its structures and not its material. So, even if rubber foam material would be the ideal material to use for creating metamaterial mechanisms with laser cutting, you can still use other materials too. Among the list of the laser cutting materials we offer, the most adequate one would be the acrylic material. If you want to get deeper into this topic, you can read the research project about metamaterial mechanisms from the Hasso Plattner Institute. We hope this article inspired you to explore more about the potential of this arising technology! If you want to continue reading about disruptive technologies with promising applications and follow the future metamaterials researches, we invite you to read this blog post about 4D printing technology!